I was in the mood for something short and sweet and so picked up The Good Luck Sister by Jill Shalvis. It is a novella in the author’s Windstone series, which I have yet to read. The good thing about series like this one though is that each book is a stand-alone, featuring different main characters. So, I do not feel lost having not read the first book in the series yet. In The Good Luck Sister, Tilly Adams feels like her life is on the right track. She has a job teaching art at the local community college and has just adopted a cute and loyal puppy. What she doesn’t need is for her old crush and former boyfriend to walk in the door of her classroom. Dylan Scott knew what he was doing when he signed up for Tilly’s class. Years ago he had left town, leaving behind the one person who meant the world to him. Now he is back, has a business of his own, and is hoping to mend the broken fence between him and Tilly. I loved Tilly and Dylan. They are great characters who obviously still care about each other. They both have their baggage and are able to work through their issues, although Tilly does not make it easy for Dylan initially. Leo, the dog, is adorable. I enjoyed his scenes, which probably comes as no surprise to those of you who know me at all. 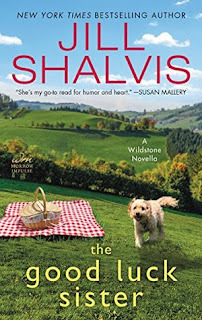 The romance is mixed with humor—two characteristics I have come to expect and enjoy in Shalvis’s novels. This was a definite pick me up that left me smiling in the end. In a twist on the original Sherlock Holmes and Watson characters, Marie S. Crosswell introduces readers to a reimagining of them as women. Sherlock is called upon by a female Detective Lestrade to take a look at the body of a homeless person found murdered. It is not the first, nor will it the last. What has caught everyone’s attention is the fact that Sherlock’s name is carved onto the bodies of the victims. A sure message to the brilliant detective, although what it means is anyone’s guess, other than that this is very personal. The relationship between Detective Lestrade and Sherlock plays a big part in this novella. The two are clearly attracted to each other—although this is new to both of them in some respects. Lestrade has had heterosexual relationships in the past and Sherlock is asexual. They take their time in feeling out their relationship, and just what the other expects and wants from one another. Watson herself is a lesbian, and I liked that Sherlock took her feelings into consideration before pursuing anything with Lestrade. I loved how their relationship played out, how well the two communicated with each other—something you don’t see enough of when it comes to romance in a novel. Each of the women in Alchemy are well fleshed out and relatable characters. I do wish there had been more time spent with Watson as that character has always been a favorite of mine in the canon. I liked Crosswell’s female version too. The mystery itself in this story is fairly weak as far as it goes. I had been excited by the notion of a female version of Sherlock Holmes and seeing her in action, but her skills of deduction left much to be desired. Things fell into place a bit too easily. Maybe had this been a full length novel instead of a novella, I would have been more satisfied. The author would have had more time to weave a more complex crime in which we could see the good detective and her partner in action. Overall, I think this novella held a lot of promise for me, but in the end didn’t quite live up to my expectations—at least in regards to the mystery aspect. For more information about the author and her books, visit Goodreads. Historical romance can be hit and miss for me, but I do enjoy it from time to time. 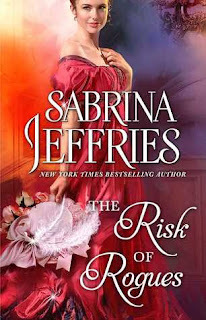 I had heard good things about Sabrina Jeffries and thought this would be a good way to taste test her writing. Lady Anne hasn’t forgotten how Lord Hartley Corry broke her heart years ago. He had fled the country without a word after her father forbade they marry, not even trying to fight for her hand. When he reappears and catches sight of her, he knows it was meant to be—only now she is refusing him. How will he ever convince her he is worth a second chance? This one was just plain fun. Lady Anne protests a lot despite how easily she finds herself returning Lord Hartley Corry’s affections once he has her in his arms—which happens a lot. The conflict between the two centers around one misunderstanding after another. At a time when men and women often married for fortune, it is no wonder Lady Anne questions Hartley’s motives, especially when he refuses to tell her exactly what he does for a living. Does he even have a reliable job? I enjoyed the banter between the two character and felt the author packed a lot of quality story into a short novella. I will definitely be seeking her work out in the future. Everyone seems to love Shalvis's work. I need to give it a try when I need something sweet to read. Kathy - I haven't read too many of her books, but I have enjoyed the ones I have read. They are a sweet escape. Jenclair - I look forward to starting the Lady Sherlock series soon. I have the first two books in the series so I have no excuse. I do sometimes love to pick up a shorter read. The Shalvis story was really good and I would not hesitate to pick up the Jeffries story. Carole - I hope you do give Sabrina Jeffries' story a try! I really enjoyed it. Sabrina Jeffries I like when I need to retreat! Mystica - I can see why! I look forward to reading more by her. I know the mystery might not be the best, but I love the interplay of characters in Alchemy. Verushka - I liked that about Alchemy too. I don;t read many detective stories but OH!!! 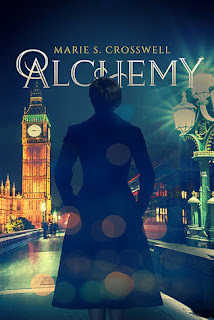 I love the cover of alchemy! And well if there is a a character that would entice me to read about detectives it would be a female version of Sherlock Holmes!! I've enjoyed a couple of Sabrina Jeffries books before so I'm glad you liked this one! Like you, historical romance can be a bit hit or miss for me but when it's done well it can be a lot of fun. Have you ever read anything by Amanda Quick? You might enjoy her historical romance novels!